I bought these blades as a set about a year ago now, however they did not last that long in my saw, they stayed in my miter saw and table saw for about a week and then they found a new home on my blade rack only to be taken down for the odd occasion when I build a deck. I paid about $40.00 for this two-pack of blades and they aren’t even worth that in my mind, but I was looking for a good deal and this popped right up. I find that the yellow strip makes more friction than anything else and it wore off onto the wood I was cutting, and wasn’t as easy to get off as you would think. After the week was over I went out to purchase two Freud blades for about $70.00 each and they were worth every penny, they are chrome so they resist corrosion and they can be sharpened up to 6 times, I will be doing a review on these soon. But as for the two DeWalt blades, they are good for contractors, not finished woodworkers, this has taught me the lesson that I have learned before of spend a little extra now in order to save a lot of money, time, and headaches later on down the road. I bought this set a year or two ago for my 12” miter saw for ~$30. They are far from the best blade around, and do have problems with tear-out, but they are essentially $15-$20 blades, and you are comparing them to a $70 blade. Hardly a fair comparison. Would I buy them again? Probably not, but they’re not bad. Better than the blade that comes with the saw, that’s for sure. I realize that these blades arent on the same playing field as the Freud blades but I guess what I was trying to say is that its better to spend the extra bit of cash and get a great blade rather than save and get a blade that is less then good, I was also trying to stress that I really am not a fan of DeWalt blades, I have a DeWalt circular saw and the best thing I ever did with that was put a new blade in it. I agree that the dewalt blades are not worth the effort. I bought a circ saw and the first thing I did was remove the dewalt blade and put a freud. Perfect. I did keep the dewalt blade though. Like most I do some minor renovation and the dewalt blade is perfect for something that only going to be covered by drywall. I agree, spend a little more up front and save the headaches later. Same here, I replaced the Dewalt blade the day I got my CMS. I bought these blades to lay my floor. Needless to say my old worn out blade cut better than the new Dewalts. Thank you for posting this…I’ve never thought the DW construction “series 20” was suitable for fine woodworking, and typically recommend against them unless for framing use. Contrary to other’s opinions here, DeWalt does make some excellent premium blades….just not this particular series. Since they have multiple quality levels, it’s inaccurate to group them all together as being equal quality. The former series 40 and series 60 blades that were made in the UK were excellent…arguably comparable to Forrest, Freud’s best, CMT, and other top blades. The series 40 and 60 blades are still around as New Old Stock (NOS), but have mainly morphed into other lines under the B&D umbrella (soon to be the Stanley Tool umbrella! )...the new DeWalt Precision Trim (PT) series (all yellow) is made in the USA and is very good…roughly comparable to lower and mid level Freud’s. The DW series 60 has morphed into the Delta Industrial series, and manufacturing has moved from the UK to the US…..ie: the DW7657 has become the Delta 35-7657, the DW7646 has become the 35-7646, etc. 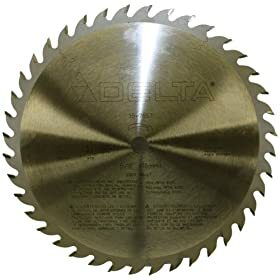 So if you compare apples to apples, you’ll will find some good to great DeWalt/Delta saw blades. One side note that’s worth mentioning, is the Freud has stopped marketing their TK/Avanti series as of June 2009….some where along the way HD is now offering a lower grade Chinese made “Avanti” and “Avanti Pro” line that is not made by Freud and is much lower quality…the HD “Avantl” knockoff appears to be the former Oldham contractor line, and the “Avanti Pro” knockoff appears to be identical to the DeWalt contruction series 20 review above….so buyer beware on those. A little homework can save you some disappointment and money.